Our uniquely circular church situated at the end of a tropical drive is within walking distance of many hotels on the south coast. Every year many couples from all over the world come to celebrate their special day at St.Dominic’s Church in Barbados. Please visit our picture gallery. For more information contact us or call +1 246 428-7677. Please see link to download the information sheet on marriage requirements in Barbados. Before wedding you need a lot of planning, perhaps you should check this wonderful website of the United States Episcopal Conference "For Your Marriage". It is full of ideas and helpful tips, also answers if you have difficult questions. Our pre marriage preparation course is based on this website too. She first visited when she was ten months old. Since then Rebecca Banasko, 30, has made 22 trips to the island. But when she arrived here last month, that trip was her most significant. She and Desmond Wong, from Liverpool, England, were married at St Dominic's Roman Catholic Church on March 10, at a fairy tale wedding ceremony which was attended by Rebecca's parents, Martin and Mari; her siblings, Christopher and John; Desmond's mum, Ann Wong, his sister Melissa, and her boyfriend Paul Greenshield. 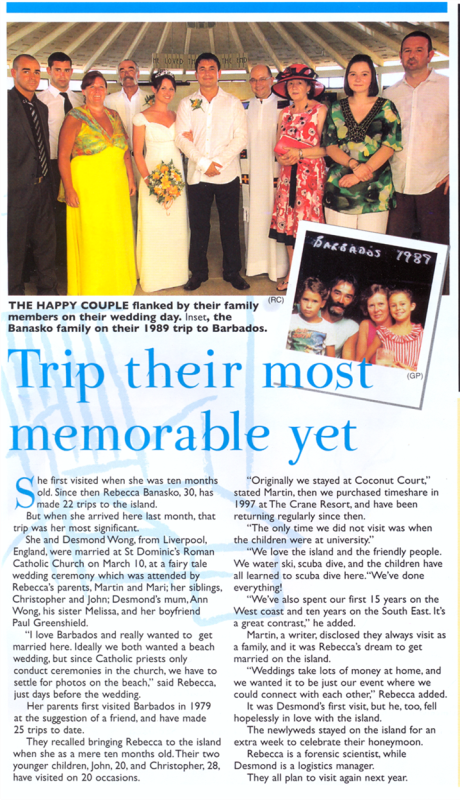 "I love Barbados and really wanted to get married here. Ideally we both wanted a beach wedding, but since Catholic priests only conduct ceremonies in the church, we have to settle for photos on the beach," said Rebecca, just days before the wedding. 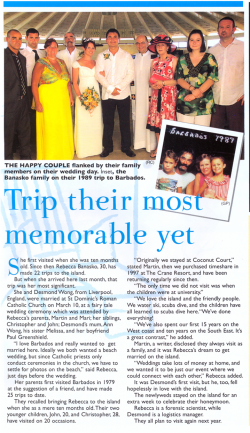 Her parents first visited Barbados in 1979 at the suggestion of a friend, and have made 25 trips to date. "We love the island and the friendly people. We water ski, scuba dive, and the children have all learned to scuba dive here. "We've done everything! "We've also spent our first 15 years on the West coast and ten years on the South East. It's a great contrast," he added.